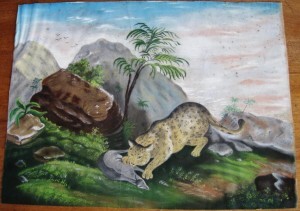 Description: Original Pastel on Paper, from Salem Academy. Artist is from Salem, NC, 1848-1905. Has remained in the Spach / Goslen family since ca. 1865. Painting has a tear in the center bottom portion, repaired with archival tape, along with foxing, staining and waviness in the upper left corner.